Postcards have been a popular, inexpensive way to record visits, remember travels and keep in touch since 1893 when the Postal service changed regulations to allow images on one side of what had been known as a postal card. 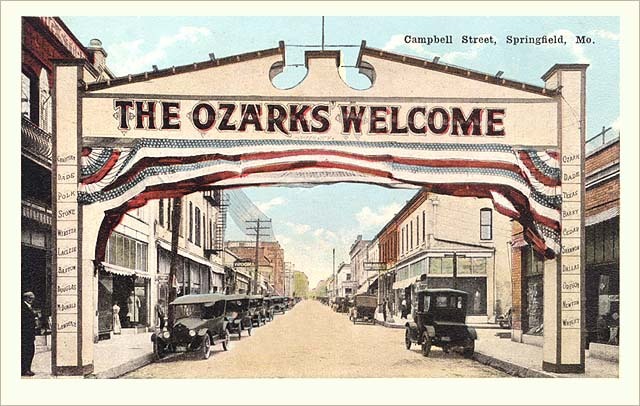 Most areas of the United States have been recorded on postcards, and many of these postcards have survived to become an important visual record of sites that were deemed significant enough to sell or distribute for promotional purposes. Most of the postcards presented here are of buildings considered important to education, government, commerce or religion; there are also cards illustrating parks, streets and residences. The narrative for each image seeks to explore the significance of the view represented, to describe them, and to place them in an historical and community context. The Library has maintained a collection of postcards as an important source of images of a retrospective of Springfield and the surrounding area. A variety of themes and periods are represented in the 113 postcards displayed. The postcards are presented in three sizes: thumbnail size for browsing, and larger images on the narrative pages, which then link to even larger images. The site can be approached a number of ways. Browse by thumbnails divided into categories via the thumbnail index. There is an alphabetical list of the postcard subjects linked to the narrative pages. The site is also keyword searchable. Find links to these pages at the bottom of each narrative page. To access bibliographic and origin documentation, select View from your browsers menu, then select Source. This project is made possible by a Library Services and Technology Act (LSTA) grant from the Office of the Secretary of State, Missouri State Library and is a reflection of the Library's commitment to providing primary source material on the internet.